New Bajaj V15 colour option spotted | IAMABIKER - Everything Motorcycle! Bajaj V15 is the latest that we have seen from Bajaj. The bike was launched a few months ago and it came into highlight mainly because of the use of scrap metal from the INS Vikrant to make a few parts of the motorcycle. Fortunately, Bajaj managed to sell a decent number of V15s. Now, to boost the sales a new Bajaj V15 colour option is available. 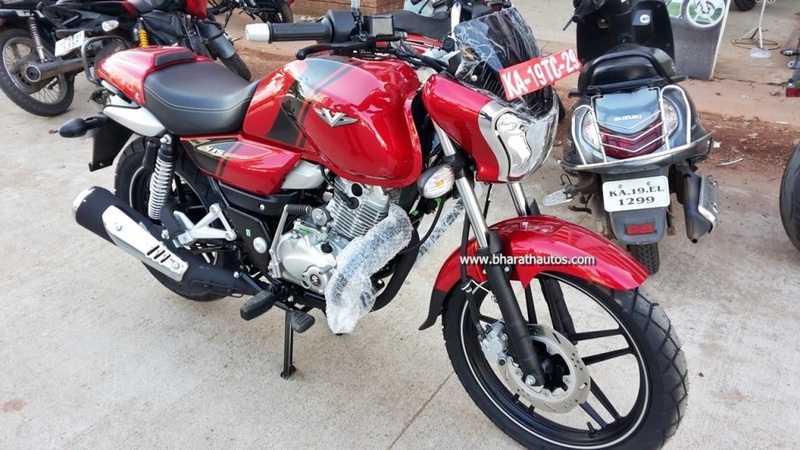 The new Bajaj V15 colour option is a dapper new coat of vibrant red with black decals. This trick, launching a new colour option after a few months of the launch of a product, is an old method of wooing in more customers. And the best part is, it works. The new colour option will be available along with the two old colour options – the Pearl White colour and the Ebony Black colour. Apart from the new colour scheme, the rest of the bike remains the same. It is powered by a 149cc, single cylinder engine that has been tuned in a state to produce a max power of 12 PS and generate a peak torque of 13 Nm. For a commuter motorcycle, the Bajaj V15 looks quite modern. It has got LED tail light, alloy wheels, wider rear tyre, comfortable ride and whatnot. It qualifies as a good looking and practical commuter motorcycle. We are expecting the new Bajaj V15 colour option to increase the sales of the bike. Bajaj V15 really got some attention from the public. In fact, because of its relation with the INS Vikrant, Bollywood celebrity Aamir Khan was so impressed that he got one for himself. Bajaj also shot a documentary in association with Leo Burnett. This documentary is called the Sons of Vikrant and is made to honour the men who served aboard the ship that was once the pride of the Indian Navy. You can watch the documentary here.